Roasting a Turkey: No Dry Meat Allowed! | This RD Eats! Roasting a Turkey: No Dry Meat Allowed! Turkey time is here! For some reason during the fall and winter I really enjoy roasting whole birds. Turkey, chicken, it doesn’t matter. I used to be really intimidated by the thought of cooking an entire turkey (or chicken). I mean, that is the kind of cooking reserved for grandmas and moms, right!? Someone who wears and apron and has mad-wicked cooking skills…. Whelp…. 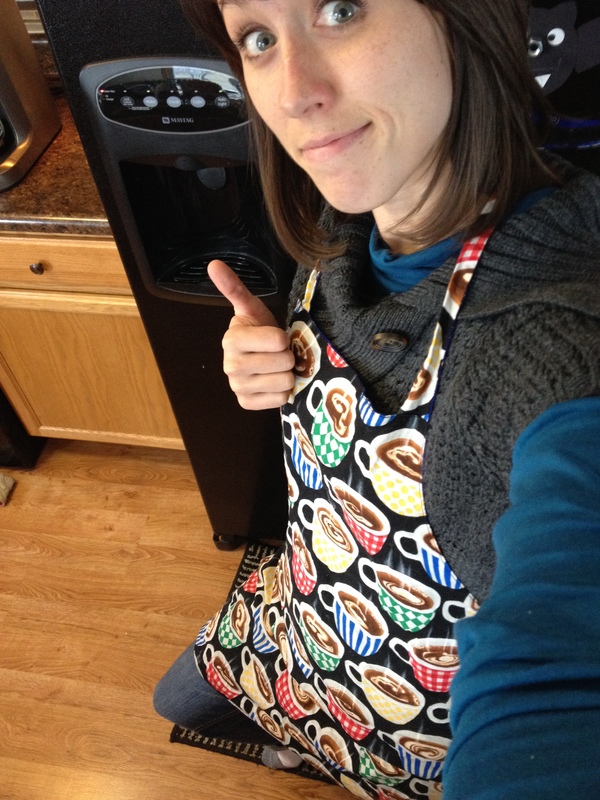 I hate to break it to you, but I am a mom (3 times over), AND, I wear an apron (a cute, coffee-themed one my friend gave me for a wedding gift). SO, let’s give this roasted turkey thing a try! I promise, you won’t be disappointed. AND you will actually WANT to eat the white meat. No dry meat allowed! 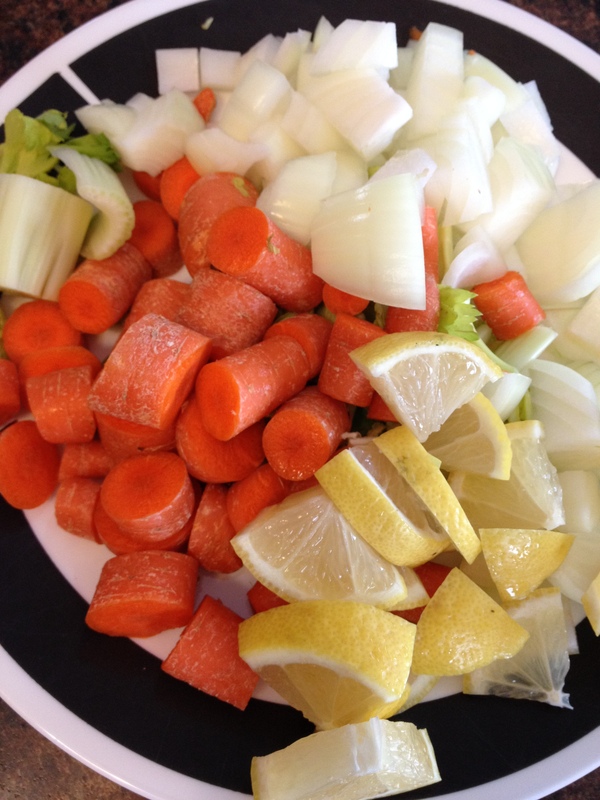 Start by cutting up some onions, carrots, celery and lemon into small chunks. No need to wash or peel the carrots (you can use baby carrots if that is what you have). For this turkey I cut up 4 carrots, 1 onion, 3 stalks of celery and 1 lemon. You can use what you have (this is a great time to use of fresh herbs you have leftover from another recipe). Once your veggies are cut up, combine salt and pepper in a separate bowl (I used approximately 2 tbsp salt and 1 tsp pepper). You will want to get all this done ahead of time, before breaking out the bird. 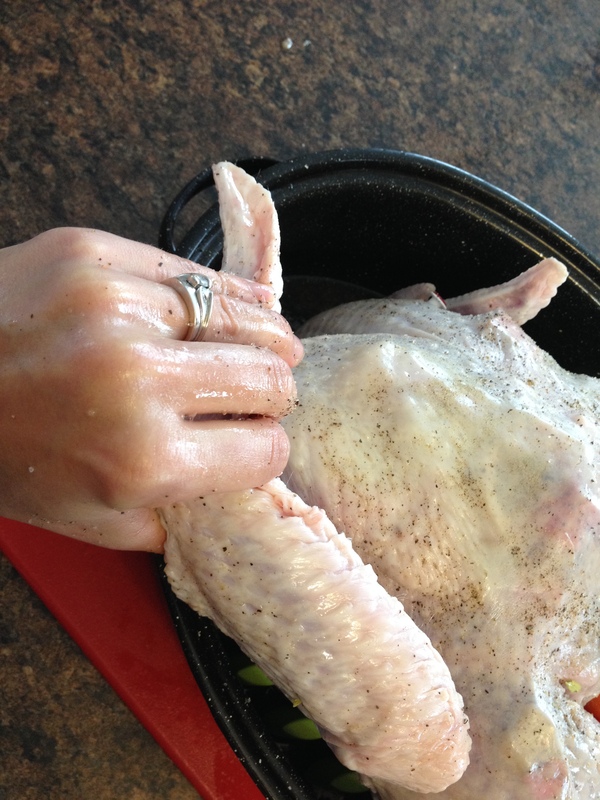 -Trust me, you will be getting your hands dirty with the bird, you don’t want to have to grab ingredients from the fridge with turkey all over your hands. Unwrap your thawed bird over the sink. This can be a bit messy because of the juices, but the sink will help contain everything. Take out the neck and any of the other packaged bit and pieces (discard or save for another use). 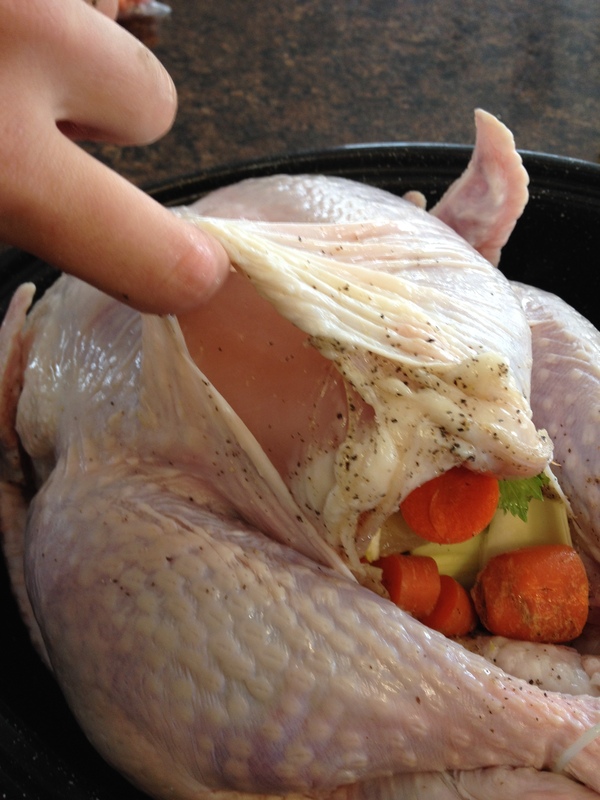 Wipe down the outside of the turkey with a paper towel. Dry skin = crispy skin. Wet skin = soggy skin. Now the fun begins. Stand that bird up (well actually, the bird will be upside down with its legs in the air). 😉 Salt and pepper the inside by grabbing a bit from the bowl and massaging it all over the inside cavity. Fill the cavity with the chopped vegetables. (I warned you that your hands would get dirty). The next step requires you to separate the skin from the meat. I promise you, you will not want to skip this part. This is how the magic happens. 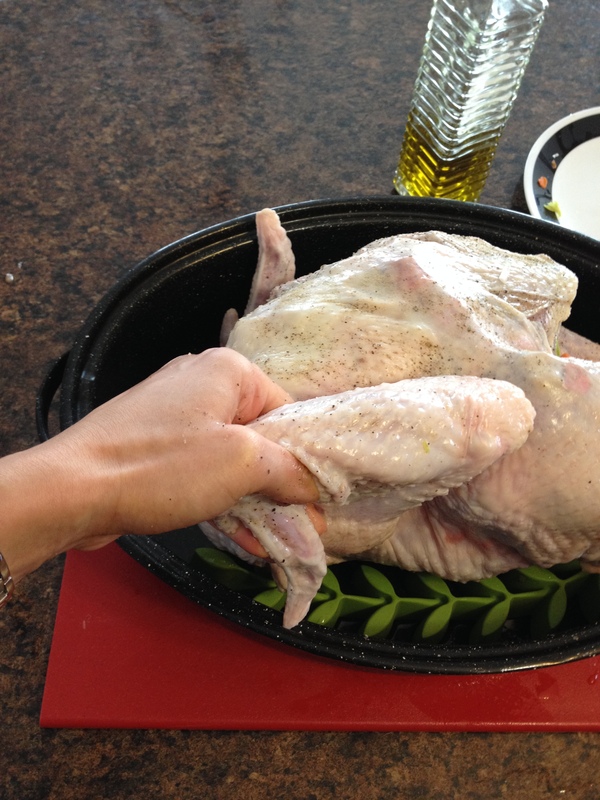 Sit the bird down so the legs are pointing towards you and the breasts are up. You will be using your fingers to do the work. Work your hands all around (don’t forget the thighs and legs. Rub more salt and pepper between the skin and meat (this is how you season the meat) then add the remaining vegetables under the skin. -Note: my photos show the bird breast-side up. I keep forgetting to take photos of the bird upside down (breast-side down). Now you are ready to pop him in the oven. I roast mine at 325 degrees for 3-3.5 hours (13# bird). I always go to the Butterball site for reference. 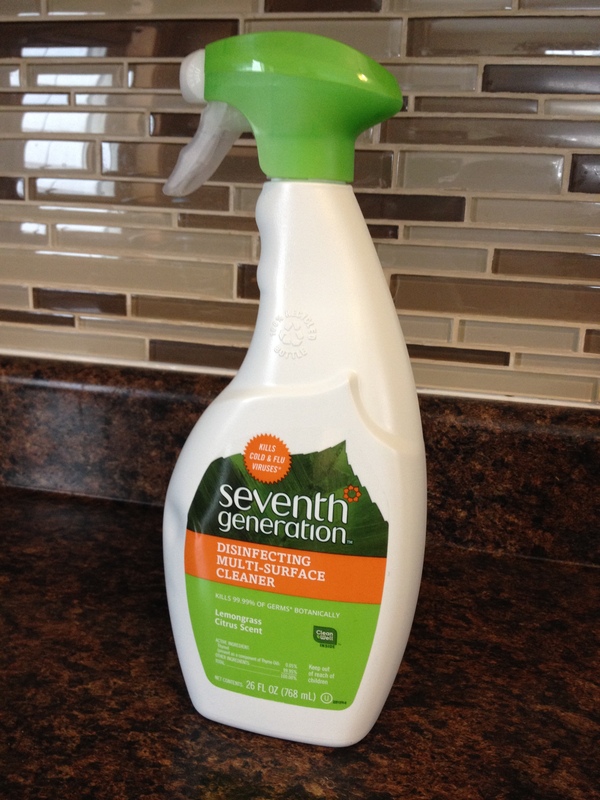 The last step is to clean up and disinfect while your labor of love cooks. Sit back and enjoy a book (or glass of wine)! I loosely cover my turkey after 2 hrs to prevent over-browning. Let the turkey rest for 10-15 minutes to keep the juices in the meat. 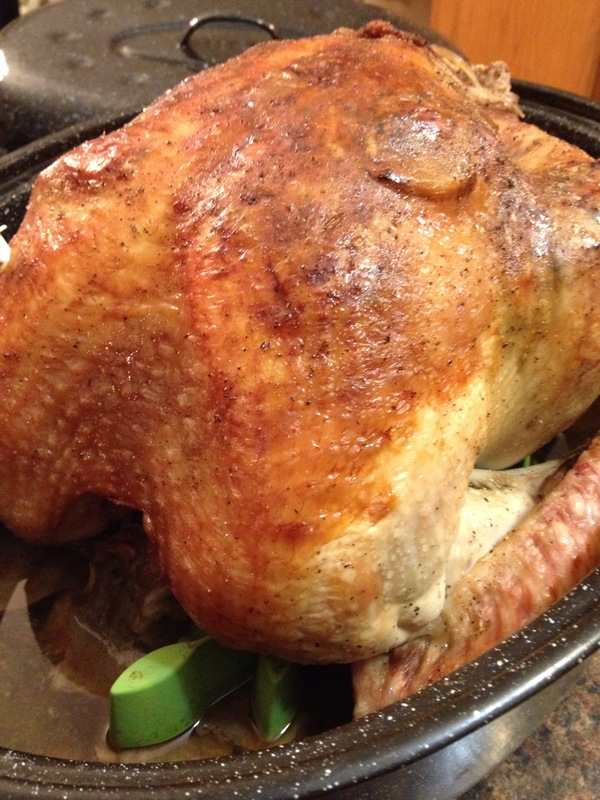 This entry was posted in Recipes and tagged how to cook a turkey, roasting a turkey, Thanksgiving, turkey. Bookmark the permalink. 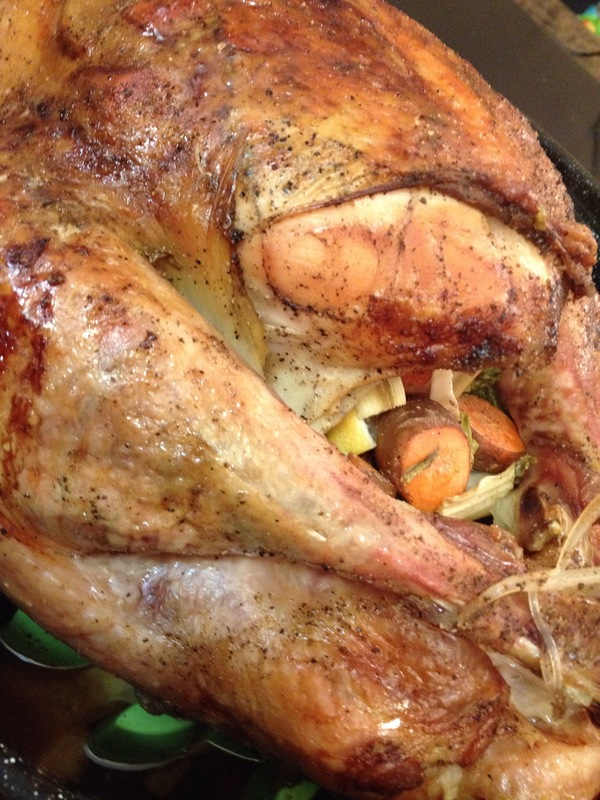 5 Responses to Roasting a Turkey: No Dry Meat Allowed! You talked about roasting the birds upside down in the oven to make the meat absorb juices but your photos don’t indicate that you did that right? Good eye! Yes, I roast the bird breast-side down. My photos are from my first turkey-roasting try (breast-side up). I keep forgetting to snap new photos. I have always wanted to learn how to cool a whole bird! Thank you for an alternate receipe for the stuffing!!!! Vegetables! How perfect!!!! 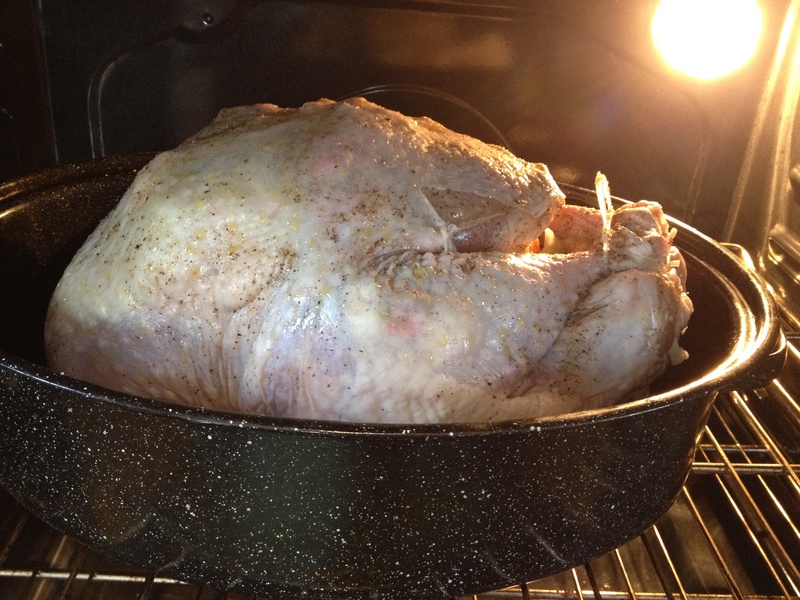 The turkey doesn’t appear to be breast side down in your photos- how did you roast it “upside down”?